Metal treads with a ribbed rubber surface. Platform W x D: 380 x 280mm. Hook on baskets and trays available to special order. This economy step comes with three rubber treads that prevent the risk of slipping and a full handrail to hold on to, so you are guaranteed full safety when using it. The steps lower on to a rubber foot which will protect your carpets and other floor surfaces from indent marks and also create a non-slip base. This product has a fully welded construction and a powder coat finish available in four colours; blue, green, red or yellow. 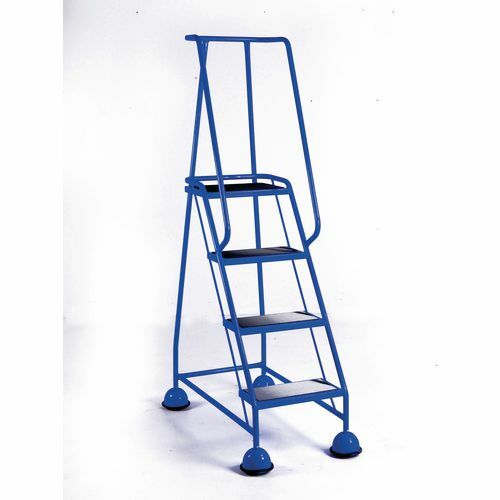 It has a maximum load of 120kg and a tread depth of 180mm so it's sturdy and durable. They are available in a choice of four heights; 508mm (2-tread), 762mm (3-tread), 1016mm (4-tread) or 1270mm (5-tread). We also have hook on baskets and trays available for special order. Our economy cup steps are a great solution for reaching levels up high, offering safety for the user and protection for your carpets or other floor surfaces. This product comes with 12 months guarantee for your peace of mind and has FREE UK Delivery.